What do you like in a cake? Course or fine grained? Moist and dense, moist and crumbly, light and fluffy, or something in between? I prefer a cake that’s dense, and so moist, that you can practically hear it when you cut it. Over the weekend I decided to make a white cake. It’s been ages since I’ve done so. One reason it’s been so long? I have been hard pressed to find a good white cake recipe that suits my preferences. I did a little research before deciding on a recipe from Williams-Sonoma’s cookbook Baking. In this case, I intended to make a couple significant changes to the recipe (which I did) so this is more like comparing apple to oranges then apples to apples. 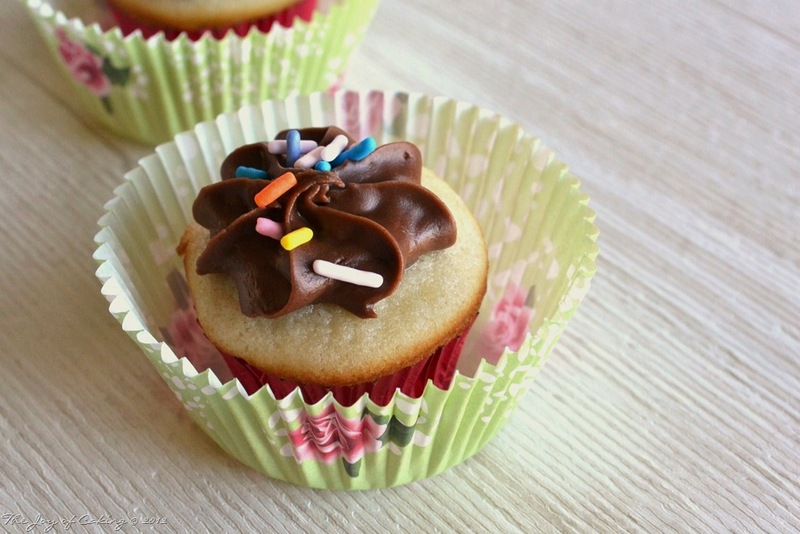 I also wanted a smaller layer cake and planned on making mini-cupcakes with the remaining batter. I’ll get to my opinion in a second. The altered version of the recipe is below. Lightly grease two 6” round cake pans with non-stick cooking spray. Cut two pieces of parchment paper to fit the bottoms of both pans and re-spray. Line mini-cupcake tins with 18 paper liners. In a medium bowl, sift flour, baking powder and salt; set aside. In a large bowl, add butter, sugar, oil, and vanilla extract; blend until smooth and light. Alternate adding flour, milk and half & half with butter mixture; mix thoroughly. In a separate bowl, beat the egg whites until stiff peaks form. Fold egg whites into batter. Pour batter into 6” cake pans about 2/3 full. 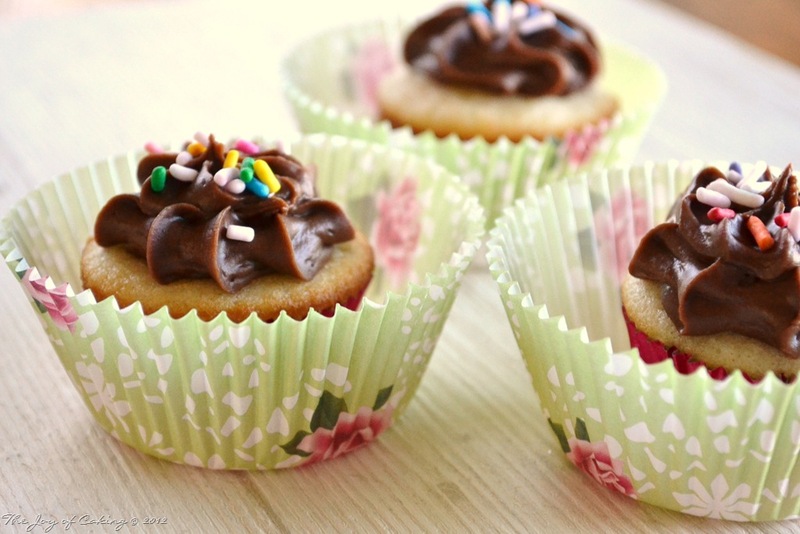 Use remaining batter to fill each mini-cupcake about 1/2 full being careful not to overfill – they will rise considerably. 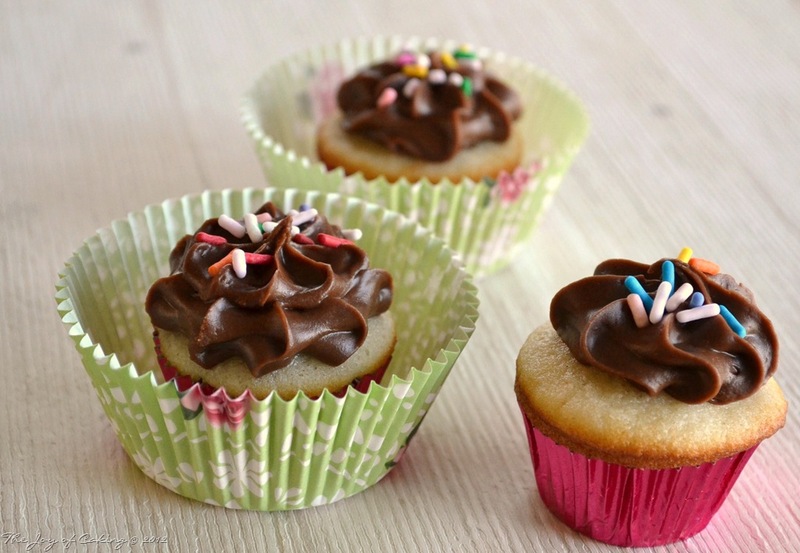 Bake cakes 30-35 minutes; cupcakes 8-10 minutes, or until toothpick comes out clean when inserted into center. Remove from oven and allow to cool slightly before removing from in pans. Cool completely on bakers rack before frosting. I opted for a cocoa frosting recipe from Betty Crocker’s Cookbook. Do you have a good white cake recipe that you think fits my criteria? I’d love to hear from you. 2 cups of flour, 1.5 cups of sugar, 3/4 cup oil, 1 cup water, 1tsp vanilla, 4 eggs, bake at 180 for 25 minutes ( maybe longer depending on the oven). It is SENSATIONAL! Cupcakes of any style are great. But your easy recipe and the fun size of these wins out over all the rest. Thanks! I love a dense and moist cake too, but these still look absolutely delicious!! They’re adorable 🙂 Can’t wait to hear when you find the recipe you’re looking for! Kristina, Thanks! And I will definitely keep you posted. Dense and moist for me too! I do love your mini cupcakes though, even if they were not up to par as you wanted. Very cute. Thanks Evelyne. I think the mini-cupcakes saved the day – lol! When you find “the one” let me know. I want a cake like that too. The cupcakes are adorable and your presentation is brilliant. Thanks Maureen. I will let you know, and if you find it first you let me know! I will try this one too. Sooner or later we have to find the perfect white cake. It sure looks good and the tiny ones are cutie patooties!